Well, here we are at the end of another amazing year. After a hectic 2013 that involved a four-month long Wolverine event and a forum changover, we decided to take things a little slower…to begin with, at least. After the merriment of Christmas and New Year, we finally got round to releasing our first article of the year, a Character Profile on Alpha Flight's Wyre. Next came our 2013 Year in Review, which, like this article, gathered together all the important articles, facts and figures you may have missed throughout the year. Finally, to finish off January, we gave you an update on one of our older spotlights and a character who had just made a big comeback… Nightcrawler. This release nicely mirrored the final Spotlight of 2013, Nightcrawler's fellow teleporting mutant, Lila Cheney. This would be the first in a long line of updates we had planned for the year as well as the first in series of teleporters that awaited UXN in 2014. Another new Character Profile, this time on the X-Factor villainess Haven, ushered in February, but she soon made way for a special release. Throughout the previous month we had been asking the forum members to help update the relationship map, and with all the suggestions on board we finally released it. After some new wallpapers for your desktops, we ended February with the first new Spotlight of the year on one of the X-Men’s oldest enemies-turned-unwilling-ally, Telford Porter, aka... the Vanisher! (And with a name like "Telford Porter," you can probably guess his mutant power.) 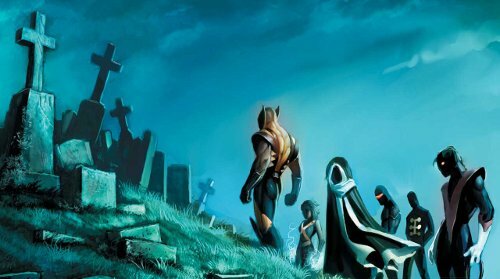 Incidentally, Vanisher, like Nightcrawler, had died during 2010's Second Coming crossover, only to return from the dead a short while later. We started off March by giving you some more wallpapers for your phone and desktop but then kicked things up a notch with yet another Character Profile on one of the X-students, Wolf Cub. 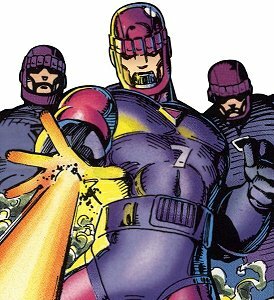 The month ended up seemingly quiet until we dropped our second Spotlight on you, this time on one of the X-Men’s newer members (and another former villain), Danger. UncannyXMen.net has been running for 14 years by now and the site had grown much bigger than anyone could have imagined. Just like the X-Men moved from Westchester to Utopia, so did the site move to a new home. For the visitors, there wouldn’t be much of a change other than the new layout and page design. But for those working behind the scenes the new site offered many new tools with which to create and display articles. With the move over and everyone settling into the new site, we could turn our attention back to the X-Men again. With the release of the Godzilla film we thought we would tie into it by releasing a Character Profile on the man who had studied the monster his whole life, Dr. Yuriko Takiguchi. But that wasn’t the only film to come out that month. X-Men: Days of Future Past, based on the story arc of the same name, hit cinemas and proved to be one of the biggest films of the year. A number of new characters appeared in the film, so we took the opportunity to make sure the fans were up to date on their comic counterparts by updating their Spotlights. Updates to the Bishop and Sunspot Spotlights greeted visitors, as did updates to our Sentinels: Engines of Evil article and to the character articles for both Blinks (616 and Exiles). To round off the theme, we also gave you a synopsis for X-Men: First Class, the film that preceded Days of Future Past. On a side note, tallying both Blinks made these releases the fifth and sixth character articles on teleporters UXN published in a six month period! It was also the final teleporter article of the year, much to the dismay of Pixie fans around the world. Meanwhile, UXN's issue summary count finally hit 6500, another huge milestone for one of the most popular aspects of the site. Welcome to Gene Nation July. The site saw a logo change and we gave you a new Character Profile on Mikhail Rasputin. We also chronicled the life of yet another Second Coming casualty (and the only one not to return from the dead), Gene Nation's Sack. We took the opportunity to update some older articles so the Morlock Tunnels entry got an overhaul with new images and updated text. Also, Marrow had come back into the X-world again after a long hiatus, so to catch everyone up on her whereabouts, we updated her Spotlight. To end the theme month we gave you a Spotlight on one of the most oft-requested characters…Callisto. The site went back to normal (for a while at least) as we released a Character Profile on the blink-and-you-miss-him X-ally, Pulse. As mentioned before, we were trying to give the older articles as much attention as the older Spotlights, so with that in mind, we updated the Reavers villain team entry to include all their recent appearances as well as a new team image. We took a brief breather to prepare for another theme month in September, but we couldn’t let UXM.net’s 14th birthday slide by without a celebration, so a couple of our staffers took on the arduous task of updating one of the oldest and biggest Spotlights on the site…Storm. Thunderbirds were go in September as another theme month hit. As some of you had noticed we didn’t include Warpath in the "Days of Future Past" updates earlier in the year. So, we gave you updates to both his Spotlight and his brother's, Thunderbird I. Whilst his text didn’t really need updating we couldn’t leave Thunderbird III out of the celebration, so all of his images got new coat of paint as well. To finish off the month, we gave a new Character Profile to the alternate Thunderbird from the Exiles. Also during September, we added a new contributor to our staff. Forum member Quick and Dead had been teasing us with issue summaries for several months, but he routinely refused to commit to anything beyond these minor flirtations. However, something was in the air in September and Quick and Dead finally cast his reservations aside, entering into a committed relationship with UncannyXmen.net. Welcome to UXN, Q+D! After an easy week at the beginning we got back into the swing of things in October by releasing a profile on Sinsear. Next was an update article on the Siege Perilous, as it had recently been used in the Wolverine and the X-Men title. Toward the end of October we saw our final Spotlight release for the year in the form of Rusty Collins, the X-Factor kiddo who met an untimely death after the Age of Apocalypse. The death theme persisted through the last week of October as Halloween crept up on us and we released an update to the Death Chart. It had been updated just a couple of years before, but the revolving door of death had been spinning rather fast recently. Another film was released in early November, and whilst it wasn’t an X-Men one, there was a link all the same. The animated film Big Hero 6 was based on the comic and proved to be a hit around the world. Whilst it didn’t include Sunfire, it did include some of his teammates. Forum member Providence (whom you may remember from several paragraphs ago) provided us with a joint Character Profile on Big Hero 6's Hiro and Baymax to remind our visitors of the connection. We quickly realized that this guy wasn't ever going to stop pestering us with timely and well-written site contributions so we just caved and accepted him into our little cabal. Hope you survive the experience, Providence! Site traffic is always quieter towards the back end of the year so the staff decided to hold of any big releases and concentrate on updating the older articles. So the site entered into the "Winter of Articles Past" and the first release was an update to the Freedom Force villain team entry. 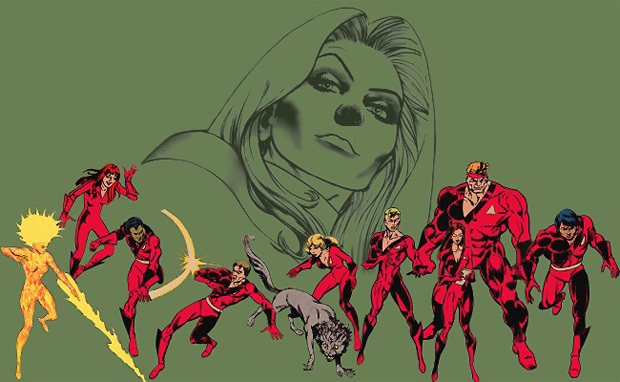 Whilst this team has not been active for many, many years, the cover image was spruced up to include a rotating team image. Another issue summary milestone was reached when the final issues of X-Men (1st series) were put on the site, meaning all 544 issues are now available to read. Whilst it may not seem a big deal, the issue summaries are a Herculean task to keep going, especially with today's increased title output and double shipping. Completing the older titles can be difficult when you are trying to keep up with modern titles too. As we entered the final month, we continued our "Winter of Articles Past" theme with the Savage Land Mutates article. New text and a spruced up rotating image gave this article the dusting off it needed. A double update of the N’Garai and the Ru’Tai saw the articles on some of the X-Men’s scariest villains given the attention they deserved. The last article of the year was an update to the Hellions villain team entry. After they were resurrected during Necrosha, this long-dead team actually managed to generate some history to warrant an update and a haunting rotating image. And none for Gretchen Weiners. Total for 2014 - 428 - That's an average of 1.1 releases a day! We've estimated Marvel produced 442 comics featuring the X-Men during the year, so we didn't quite break even however given the X-Men characters crossing over into a plethora of Avengers titles, The Death of Wolverine titles and the major Marvel crossover AXIS, color me impressed that we were that close. As we came into 2014, we decided to keep the Nightcrawler logo that we released at the backend of 2013 for a few months until releasing the following 2 movie inspired logos on random rotation. This was followed by our All New X-Factor inspired design which had been created and planned for release earlier in the year for the upgrade to the site, but was pushed back due to the decision to make some movie inspired designs. our last logo of the year, was our Thunderbird themed design, release in September. Whilst we may have decreased our wallpaper output we still tried to give you some fun desktop and phone backgrounds with an X-Men twist. In January, we gave you All New X-Factor inspired designs. 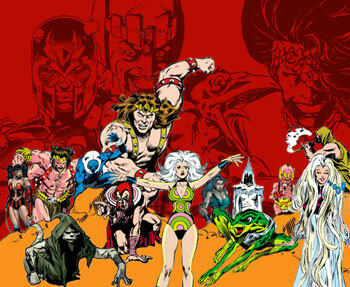 In March, X-Men 2099 & Deadpools wedding were added. Whilst the site may seem rather quiet at the moment, beneath the surface the UXN contributors are busy planning an amazing year. With our schedule planned all the way up to the end of May so far, you can expect us to hit the ground running in 2015 with some all-new articles and Spotlights. You are also going to be seeing a lot more of our uncanny theme months as we continue to offer new articles as well as update some of our older ones. All in all, you aren't going to want to miss a single week as we continue to grow into the premier internet site for Marvel's merry mutants. As we finally say goodbye to 2014, we just want to say thank you for sticking with us all year. As you know we are always on the lookout for help, whether it is doing issue summaries, scanning images for use or even writing articles. If you think you might like to help out please feel free to contact one of us. Who knows -- maybe it will be your name in lights during the 2015 Year in Review.